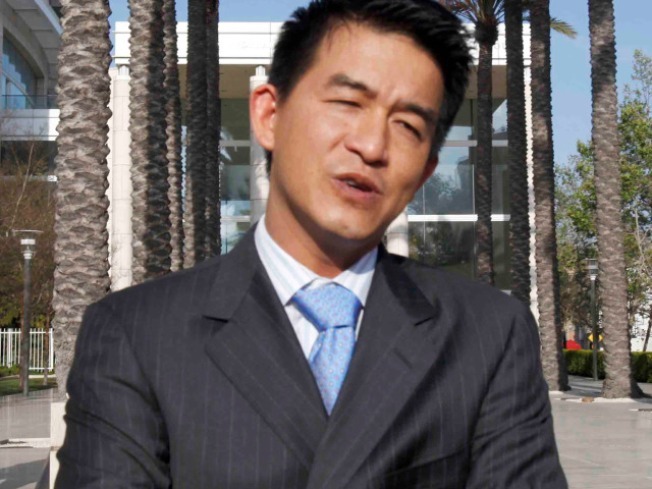 In this April 29, 2009 file photo, Danny Pang pauses after leaving federal court after posting bail in Santa Ana, Calif. Danny Pang, an Orange County financier who was the subject of a fraud investigation by the Securities and Exchange Commission, has died. The Orange County coroner's office says the 42-year-old Pang died Saturday at a hospital, one day after after being taken from his Newport Beach home by paramedics. An autopsy is scheduled Sunday to determine the cause of death. A California financier accused of bilking his investors out of hundreds of millions in a Ponzi scheme to support a lavish lifestyle, Danny Pang, has died. He was 42. Newport Beach police said the cause of death was not immediately available, but foul play is not suspected, according to reports. Pang, the founder of Irvine-based Private Equity Management Group Inc. and Private Equity Management Group LLC, had been free on $1 million bail and set to go to trial next week. His companies have been put into receivership. "Danny was a wonderful husband, loving father, and honest businessman," Pang's family said in a statement, The Associated Press reported. "It is distressing that Danny had to endure such a mean-spirited assault on his character without ever having a chance to defend himself. "We remain steadfast in our believe that Danny would have been vindicated if he had been given that opportunity."